I announced that I was running the Runner’s World Half Marathon in Bethlehem, PA in October over the summer and my plan for the 10 weeks leading up to the race was to journal my training here at FBS. I wrote the same series before my spring half marathon and I was successful in writing all 10 weeks. This time around–not so much. I started writing another series, 31 Days to Find $1000, in October, and that took most of my time and energy in October. Other topics would have to wait. My last update post was back in September, but I followed the same training plan that I used in the spring and the recap of each week is in this post, Race Day Success. As hectic as October was, I did finish this race. It was a beautiful day. I had a blast. And now I hibernating until March. 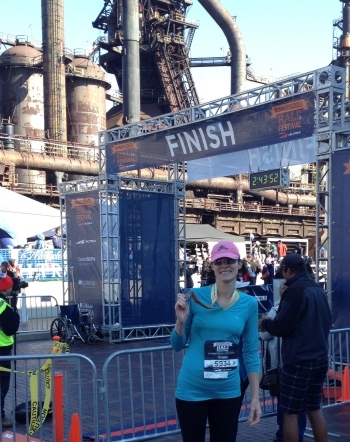 The Runner’s World Half Marathon was a very different experience for me. For the first time, I ran with a college friend. In fact, she lives nearby, so I left my family at home and stayed at her house for the weekend. 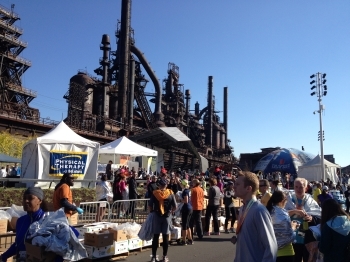 The race took place in Bethlehem, PA with the start and finish at the historic SteelStacks. SteelStacks is a ten-acre campus dedicated to arts, culture, family events, community celebrations, education and fun. 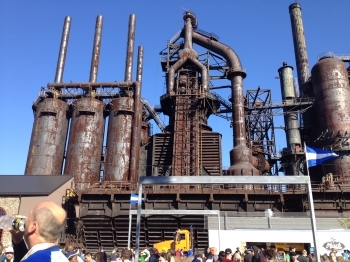 Once the home plant of Bethlehem Steel, the second largest steel manufacturer in the nation, the site has been reborn through music and art, offering more than 1,000 concerts and eight different festivals annually. It was a stunning location. My pictures do not do this location justice, so to get a true picture of SteelStacks, check out the SteelStacks website. This was the first time that I ran a race with someone. I usually run alone without talking to anyone for the entire 13.1 miles–just me and my music. At mile 8, my friend needed to stop talking and concentrate on running, so I put on my earbuds and picked up my pace a bit. I finished the race in 2:19, over 20 minutes longer than my fastest time. But that’s okay. I knew running with someone would slow my pace down a bit and I felt really good the entire race. I also had a blast chatting with my friend. The course was absolutely beautiful, but excruciatingly hilly. Thank goodness I trained on some hills! In January, I’ll plan my two big races for 2014. I’ll continue to run between now and then to stay in shape and to help ward off the extra pounds that holiday cookies tend to bring with them. What race are you training for? Tell us all about it in the comments.